Aerosol samples collected over a tropical location, Thumba, southernmost West Coast of India were analyzed for the abundance of homologous dicarboxylic acids (C2 to C12), oxocarboxylic acids (ωC2 to ωC9, pyruvic acid), α-dicarbonyls (glyoxal and methylglyoxal), organic and elemental carbon. Among the measured organics, oxalic acid was found to be the most abundant species followed by succinic and/or malonic acids. As oxoacid and α-carbonyl groups, glyoxylic acid and glyoxal, respectively, were observed to be dominant. On average, dicarboxylic acids accounted almost 2.1 ± 0.7 % of the aerosol total organic carbon. Among the aerosols over Thumba, two types of formation pathways were noticed for oxalic acid. During the post-monsoon and winter periods, the photo-oxidation of biogenic and anthropogenic volatile organic compounds lead to the formation of oxalic acid through a chain reaction involving glyoxal, methylglyoxal, pyruvic and glyoxylic acids. In contrast, during the pre-monsoon, the oxidative degradation of the biogenic unsaturated fatty acids give rise to succinic acid, which can be decomposed to malonic acid and then to oxalic acid. 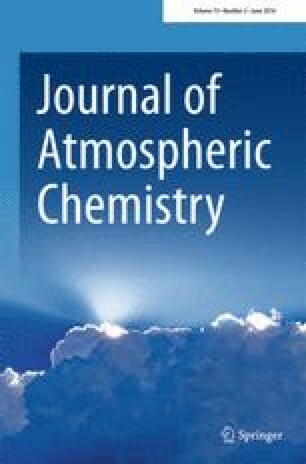 The observed seasonal variations in acid concentrations are consistent with photochemical production and the subsequent accumulation under favourable meteorological conditions prevailing over the region. This study was partly supported by Japan Society for the Promotion of Science (JSPS) through grant-in-aid Nos. 19204055 and 24221001. We also appreciate the financial support of a JSPS fellowship to P.H., during which the author was on sabbatical from Indian Space Research Organisation (ISRO), Government of India.